Story time because I want to be that guy that talks about finding my grail for way longer than I should knowing it's probably not that interesting. If you don't care, skip to below the line for me rambling about the future of the comic instead. 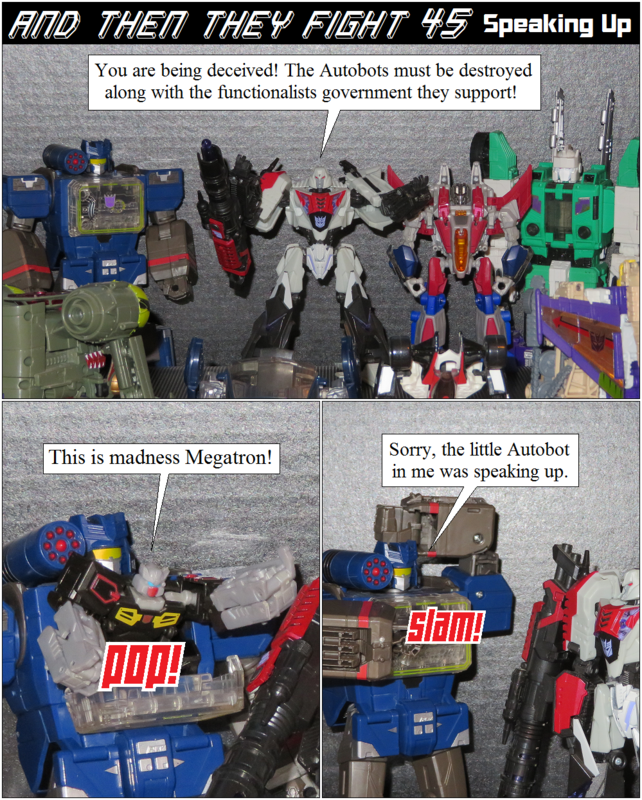 This comic came about when I got back from LexCon 2016. 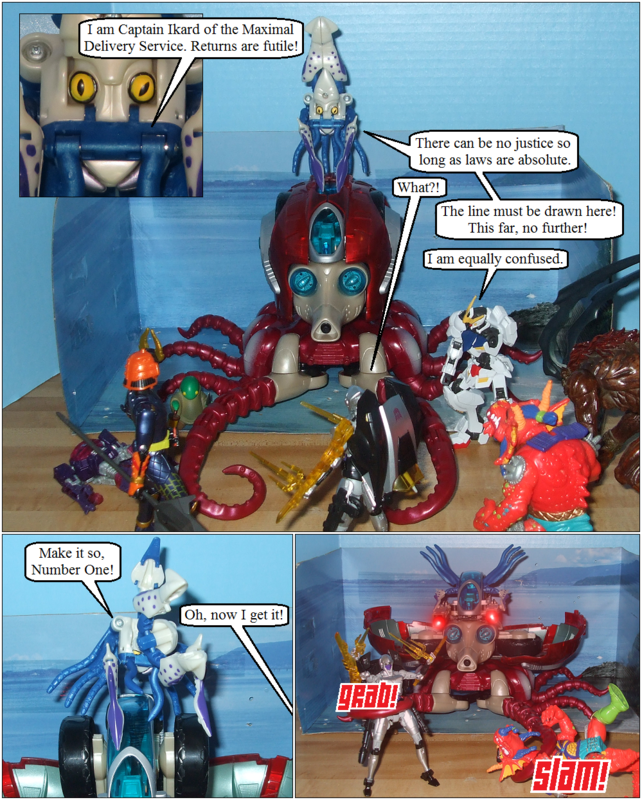 The Tako Tank had been my grail since Botcon 2006 when I decided I wanted every mold made for Beast Wars, even the wacky stuff. Especially the wacky stuff. After getting pretty much all the US and Neo stuff, the BWII stuff was proving difficult. When prioritizing what I wanted most, the Tako Tank quickly went to the top of my list. 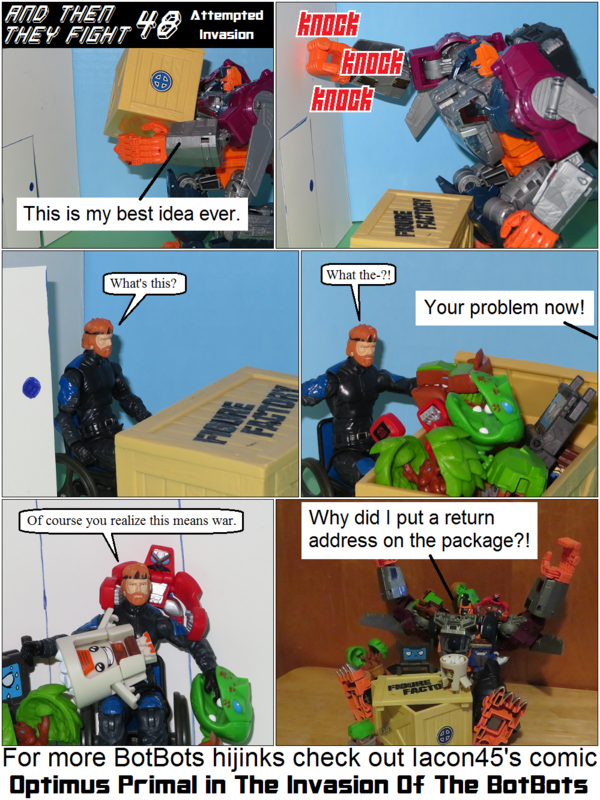 It was interesting and unless the Niagara Base, looked like it interacted better with the other toys. Fast forward to 2016, when I was doing well (at the time, at least) and not sure what I was going to buy at that year's LexCon. I was hanging out at the Captured Prey (CP) booth, having just bought an Astro Megazord from them (came back for the Shockwave and Nightbird used in the comic later), when one of the booth workers returns with a Niagara Base in their arms. My first question to them was where they found that and is there more. He answered that there were no more Niagara Bases, which was fine, but there was a Tako Tank, which was even better. I'm very thankful for the people working the CP booth that night because not only did they alert me to a Tako Tank, one of them was kind enough to lead me to the booth. Now if you were ever at a Botcon, the dealers room is about the same size most years and Botcon 2006 was in the exact same room that CP's booth was in at LexCon that year. That dealer room was LexCon's secondary dealers room on the 3rd floor. The main dealer room was on the 1st floor and is at least 3 times bigger. It's also about 5 times more crowded. So they lead me to the booth. I had pass this booth at some point noticing only that they had a case of Transformer prototypes, something I'm not into collecting, but fun to look at. They had the Tako Tank pretty far behind the counter blocked from my view. Mint in box, something I don't care that much about, but in a case like this, it means it's 100% complete. After discussing the price and me rushing back to my hotel room for more money, I got my Tako Tank. I did ask the seller where he got it in such good shape. He said he bought it from a former Kenner employee that was clearing out all his work related toys, including some of the prototypes. Do I believe him? I don't know, but for the purposes of this story I do. Anyways, that's how I got my Tako Tank, my grail of 10 years. Hope I didn't bore you. Now let's talk about what's next for ATTF. And Then They Fight 45-49 will be gag strips. 47 was already posted (the Super Bowl one). 48 is special, but I'm not saying how. 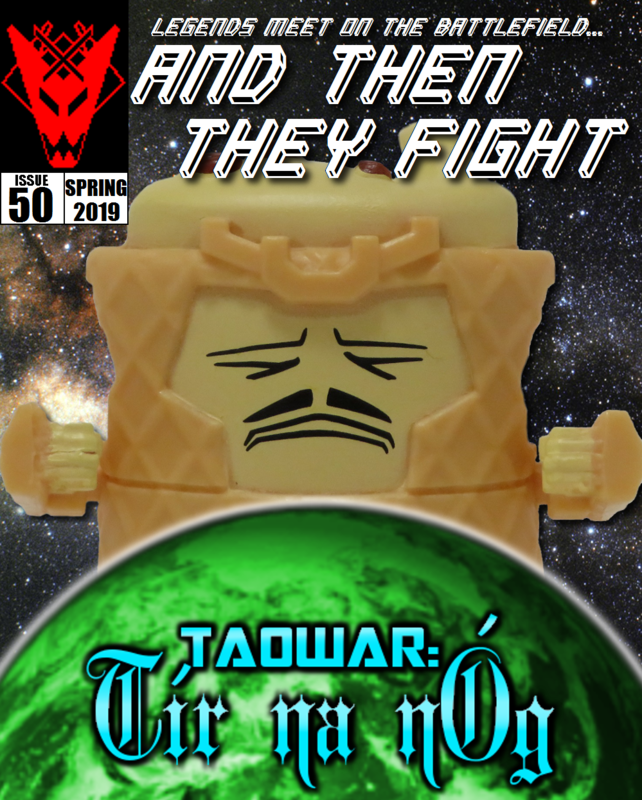 After that, ATTF 50 will be a return to the TAOWAR storyline. Few notes about that. I'm reducing "T.A.O.W.A.R. 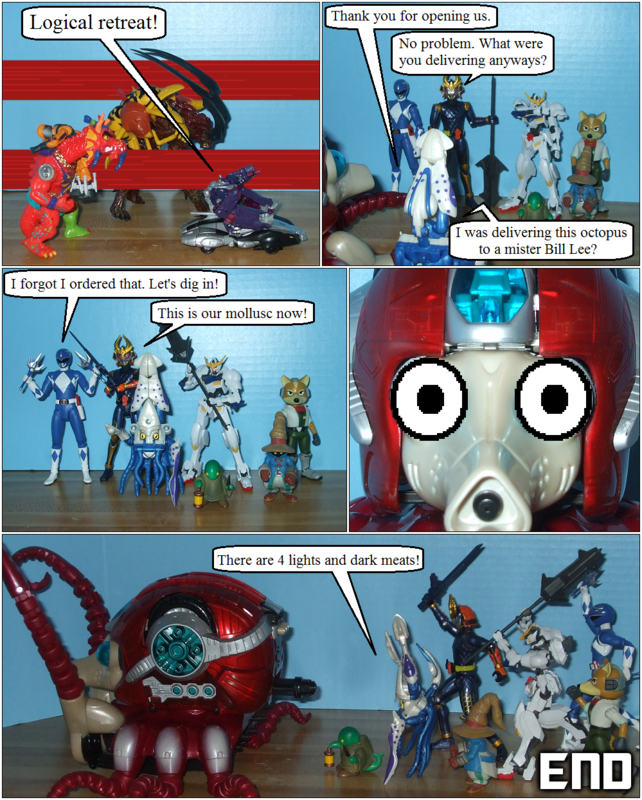 : The Adventures of W. and Raider" to just "TAOWAR." I thought about dropping it completely, but it notes that it's part of a storyline for easier reading, similar to The Grail or Spy Troops (which I do plan to continue). This will be the Land of Summons story I've always wanted to get around to, but never could. Aside from being a continuation of the TAOWAR storyline, this will be a mostly shelf contained story meant to tie up loose ends and have some fun in the Land of Summons aka Tír na nÓg. And since this post is one of the longest I've done in a forever, here's the cover of #50. Behold, the main villain of the story that all will strike fear in all! Now for one of the more dumb jokes I've written this year. This week is a short little comic I've been excited to share for awhile. Enjoy.